CNN's Ed Henry reports a GOP lobbying firm is seeking to undermine the Iraqi prime minister, above. CRAWFORD, Texas (CNN) - A powerhouse Republican lobbying firm with close ties to the White House has begun a public campaign to undermine the government of Iraqi Prime Minister Nuri al-Maliki, CNN has confirmed. This comes as President Bush is publicly taking great pains to reiterate his support for the embattled Iraqi leader, whose government has come under sharp criticism and scrutiny from Washington lawmakers and officials and Thursday's National Intelligence Estimate. "There's just no connection whatsoever," the official said. "There's absolutely no involvement. The lobbying firm boasts the services of two onetime foreign policy hands of President Bush: Ambassador Robert Blackwill, the former Deputy National Security Adviser, and Philip Zelikow, former counselor to Secretary of State Condoleezza Rice. Ingrid Henick, a vice president for Barbour Griffith & Rogers, confirmed to CNN the firm has signed a contract to "provide strategic counsel for and on behalf of Dr. Allawi." When asked whether the White House will call the prominent Republican lobbying firm to stop lashing out at al-Maliki, the senior administration official said "I don't rule it out" because of the President's support for the prime minister. Pressed on why allies of the White House would be contradicting the president so publicly, the senior administration official said of the lobbyists, "They're making a lot of money." "Please see today's news items regarding the increased skepticism of the Maliki government in The New York Times (embedded), The Washington Post and The Wall Street Journal (attached), along with a joint statement made by Senators Carl Levin and John Warner," said the e-mail obtained by CNN. A second e-mail from the lobbying firm sent congressional staffers a copy of a recent Washington Post op-ed by Allawi that said Iraq will fall apart unless al-Maliki is forced out of power. The outlines of the lobbying campaign were first reported by the news blog, Iraqslogger.com. The lobbying e-mails were sent Tuesday, the day after Levin called for the ouster of al-Maliki upon return from an official trip to Iraq with Warner. Also on Tuesday, President Bush appeared to be softening his support for al-Maliki at a press conference by expressing frustration with the pace of progress by the Iraqi government. But on Wednesday, upset by media reports asserting he was backing away from the Iraqi leader, Mr. Bush clarified in a speech, "Prime Minister Maliki is a good guy, a good man with a difficult job, and I support him." The e-mails to congressional staffers directly came from Allawi himself from the e-mail address "DrAyadAllawi@Allawi-for-Iraq.com." "Yes, in fact, we recently filed forms with FARA," Henick, the firm's vice president, told CNN. But she would not provide details of the filing, which will reveal how much money the firm is making on the account and other details, because the Justice Department has not yet made the documents public. One Republican congressional aide who received the e-mails this week expressed surprise that a lobbying firm with such close ties to the White House would attack al-Maliki at such a pivotal time on the debate over the war, just weeks before the President provides a progress report to the nation. The lobbying firm was founded by conservative stalwarts Haley Barbour, the former Republican National Committee Chairman and current governor of Mississippi; Lanny Griffith, who worked for the administration of former President George H.W. Bush; and Ed Rogers, an aide to former Presidents Reagan and Bush. But the current Bush administration official dismissed the effort, noting there's a "lot of lobbying" on various issues and the campaign against al-Maliki is just a "bunch of noise in Washington, D.C."
You didn't expect us to export democracy in its purest form did you? It would be neglectful of us not to give them a 'mature' form of our government saddled with all of the corruption big money can bring to it. If they ever get up and running by themselves, with their mineral reserves think what their version of "Big Oil" will do over there. Probably show our guys a few new tricks. 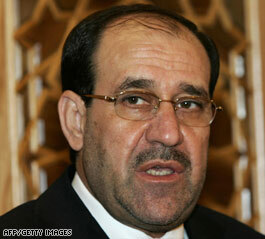 Maliki will have to borrow a line from Scooby-Doo soon.... "And I would STILL be PM if not for those meddling kids"